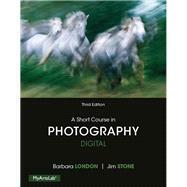 Modeled after the widely used A Short Course in Photography:Film and Darkroom, the third edition of A Short Course in Photography: Digital presents photography entirely in its current, electronic form. This brief title demonstrates greater emphasis on the most up-to-date learning techniques, allowing students to keep up with modern technology. A Short Course in Photography: Digital teaches readers to emphasize their choices in picture making by presenting in depth basic techniques of photography. In additional to covering the basic techniques of photography, this title covers the impact of computers on this important art form. MyArtsLab is an integral part of the London / Stone program. Engaging activities and assessment are part of a teaching and learning system that helps students gain a broader understanding of photography. With MyArtsLab, students can explore in-depth analyses of relevant artwork, architecture, artistic techniques, and more. Jim Stone is an Associate Professor of Photography at the University of New Mexico. His photographs have been collected by the Museum of Modern Art and The Smithsonian American Art Museum, among many others. Books of his work include Stranger Than Fiction (Light Work, 1993),Historiostomy (Piltdown Press, 2001), and Why My Pictures are Good (Nazraeli Press, 2005). He has also published six higher education titles that are widely used in university courses: A User¹s Guide to the View Camera, Darkroom Dynamics, Photography, Photography: The Essential Way, A Short Course in Photography, and A Short Course in Digital Photography.